Established in 1984, Scott's Auto Machine provides high quality machine shop services and engine parts at competitive prices. We are a full service automotive machine shop and an authorized rebuilding facility for GM Factory Sealed 602 and 604 Crate Engines. Delivering a quality product with customer satisfaction is our goal. 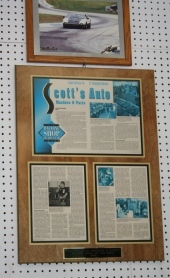 Scott's Auto Machine and the founder, Scott Dooley, have been acknowledged and honored by several industry or industry-related magazines and newspapers over the years. 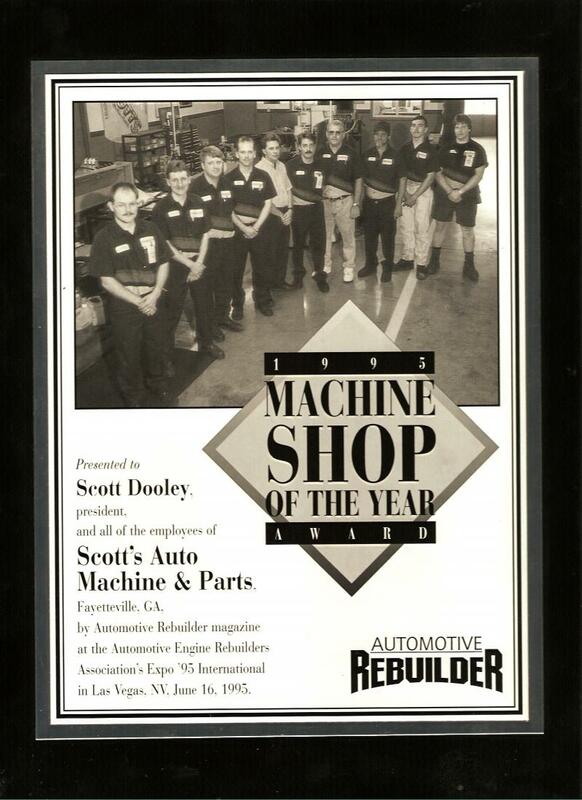 The highest honor received by Scott's Machine was the "1995 Machine Shop of the Year" award from Automotive Engine Rebuilder Magazine. Scott Dooley began his career as a machinist for Genuine Parts Company/Napa Stores in Atlanta, Georgia. After working there as a machinist for almost eight years, Scott opened his own automotive machine shop business in Fayetteville, Georgia. So, in 1984 Scott's Auto Machine was established. 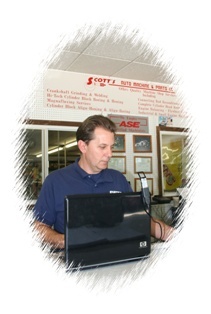 Scott has been involved in the industry in many ways over the past 31 years. He has been a member of several industry-related organizations and has attended many industry-related conventions, shows, and events. He was A.E.R.A. 's(Automotive Engine Rebuilders Association) Vanguard Chairman and later worked his way through the chairs of the A.E.R.A. Board of Directors. He became the Chairman of the Board in 1999 and is currently listed as a past chairman on A.E.R.A. 's past chairman advisory board. A.E.R.A has provided Scott with connections to a network of professionals all over the U.S. (and internationally) who are in or involved in the automotive engine builders/rebuilders industry. By continuing his involvement in the industry and staying committed to the industry, Scott provides his customers at Scott's Auto Machine with the best built or remanufactured engine products possible. Our certified well-trained machinists have almost a "century" of combined automotive machine shop experience. Our customers are treated like our family and friends and our machinists treat your engine work like it is their own. Our machinists take pride in their work and put the customer's satisfaction first. Quality is first with them. No detail is overlooked in their machine work. Our machinists have many outside industry-related interest that include circle track asphalt and dirt racing, drag racing, road racing, restoring antique and classic cars, and restoring antique tractors. They have all done restoration projects of their own and appreciate the care taken to restore an engine to its original or improved condition. Our machinists are also racers, or have been racers or pit crew members. Therefore, they have motorsports experience and are passionate about their high performance work. Their personal experience brings valuable added knowledge and understanding to their job. Our customers know when they leave their work at Scott's Machine, they have left it in good hands. So, give us a call and trust us to help you with your next engine project or your machining needs. Celebrating 31 Years of Service to our Customers!